The decision to live permanently on a boat is one that will mean many considerations but they’ll be multiplied even further if you’ve children and pets to consider as well. It’s crucial to look at all of the implications of how life afloat will affect your children looking at both the positives and potential negatives and, more importantly, it’s such a big shift in lifestyle that you must allow them to express their thoughts and opinions, especially the older they are. As far as younger children are concerned, they might not give it much thought beyond thinking of it as simply one big adventure. As for pets, well you’ll obviously not be able to seek out their opinion but you’ll certainly need to consider the implications and whether or not they’re likely to be easily able to adapt to life on board and it’s almost certainly essential to have taken them on a boating holiday or some kind of boat trip first to see how they react before assuming that they’ll simply be as enthusiastic about the change in lifestyle as you are. Then there are space considerations. Will the boat be big enough to accommodate the family and your pets as well and how will all of these living ‘creatures’ cope with life in a relatively cramped space? 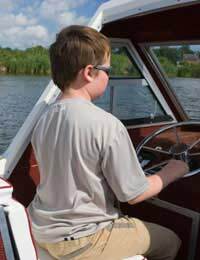 The considerations about moving your children to living on a boat will vary depending upon things like their age and whether or not they’re still at school or not as well as taking into account their own personal views. Whilst you, as parents, may think they’ll have much to gain from their experience of living on a boat, it’s important to think about what they might lose or miss out on too. If you’re a very close knit family who tend to spend a lot of your leisure time together and you all love the outdoors, life on the water might be perfect but what about your children’s existing friends. You’ll need to consider how leaving them behind will affect them and how easy or difficult it might be for them to make new friendships out on the water. Perhaps, more importantly, what about schooling? That might not be a major problem if you’re simply going to be remaining at a marina or mooring for the vast majority of your time and then they can simply attend a local school nearby but what if you’re planning to travel around a lot? Are they going to be able to adapt to being ‘home tutored’ and is that going to suit you as parents also? Then, if they’re quite young, there will also be the added issue of safety and the additional vigilance you as parents will need to provide alongside the stress this may cause. The simple truth is there’s no real way of knowing how a pet, and by that we’re going to assume it’s a cat or a dog we’re concerned with here, is going to adapt to living on board a boat. Cats are usually fairly well able to adapt to life afloat in spite of the fact that they generally dislike water but we’re all familiar with the time-honoured tradition of a ship’s cat so it’s unlikely to become much of a problem for a cat to adapt. A dog is an entirely a different prospect however. Although some dogs love to swim and most dogs have a natural ability to swim, many of them do not particularly enjoy it and others are equally not strong swimmers so it’s always a good idea to have taken a dog on some kind of boating holiday first of all to see how it adapts to life on board a boat before simply whisking it away to its new life on the water as your dog may become distressed by that. Even prior to that, you should have at least taken your dog to some kind of lake or pond to see if it enjoys being near water and to ascertain how much it likes swimming and how good a swimmer it is. Then there are external issues such as how other boat owners are going to react to you having pets onboard if you’re permanently moored up or living in a marina and to find out if pets are permitted first of all and, just as important, if they are welcomed by most boat owners. Certainly, there are many families with both children and pets who have successfully made the transformation to living on board a boat but it does need a lot of careful thought and there will be many additional considerations to take into account as well as gauging opinions before you decide to take the plunge.